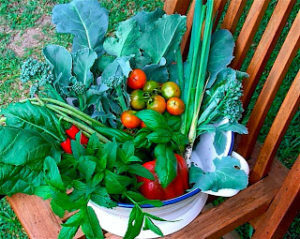 If you hear a gardener cursing they have probably noticed some fruit fly damage on their tomatoes/nectarines/citrus etc. It’s one of the most disheartening things about gardening in a fruit fly prone area – to nurture a crop to maturity only to see, just as it’s ripening, the destructive damage of the fruit fly, which ruins all the fruit. This was just about to happen to my tomato crop when Rasa came to the rescue. I was up at her wonderfully productive garden for a Seed Savers event when I noticed bottles like these hanging from all the fruit trees. I realised they were fruit fly baits and now I have her very effective recipe which is working in my garden too. I think it’s quite ingenious and a better design than any others I have seen. Do it early in the season to help interrupt the life cycle of this pest. 3. 2 litres warm rainwater, 2tbs honey, 2tbs cloudy ammonia or urine and 2tsp vanilla essence. Mix it up until the honey has dissolved. 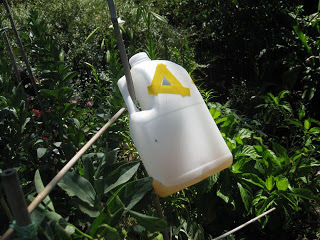 Cut three triangle shapes in the bottle and surround them with the yellow tape (this attracts the critters). This amount is enough for about five bait bottles. You will need to replace the brew regularly because it gets full up with fruit fly! This depends on your situation – it could be weekly or monthly. Update 1 October 2014. While the above recipe is effective it tends to be rather smelly – you can try the following for a less offensive brew; any kind of fruit juice, a sprinkle of sugar and brewers yeast – mix it up and use the same container as above. There are several pests described as ‘fruit fly’ in Australia. The main one in the eastern states is Queensland fruit fly (Q fly) Bactrocera tryoni, which is native to rainforest habitat on the east coast of Australia. It is generally more active as the weather warms up in the summer. The female flies lay their eggs in small groups just beneath the skin of fruit. The larvae are referred to as ‘maggots’ and are creamy white, tapering towards the head and between 7-9 mm long when fully grown. Q fly develop from eggs to adults within 5 weeks in hot weather. The maggots hatch and by their feeding as well as bacteria they carry, cause the fruit to rot and drop. When the maggots are fully grown they leave the fruit and burrow into the soil, where they pupate. That is why it is very important to clear up rotting fruit from under the trees and remove it from your plants and destroy it when you notice the damage. What does the damage look like? On tomatoes you will see a black little pinhole – if you cut it open you will see the ‘maggot’ damage. Adults can live for many weeks and flies commonly over-winter as adults, becoming active when the weather warms up around August and gradually the population builds to a peak in late summer. Trees that fruit early in the season (like loquats) and fruit late (like figs) can help this pest to ‘overwinter’ and perpetuate the cycle so think about removing them. The tiny flies that hover around the fruit bowl are fungal gnats and are attracted by decomposition; they are commonly mistaken for fruit flies. NOTE: I am wary that these baits may also catch desirable insects like bees, hoverflies and lacewings so that needs to be monitored. I will give you an update. Pest control is high on our list when we are looking to keep the pests out of our home and yard.